Nothing makes me want to live off the grid more than dealing with government agencies. The only problem with off the grid living is the lack of niceties and little comforts I’ve grown accustomed to. I mean, where would I get the vanilla almond butter I’m addicted to or a pedicure? First world problems I tell ya. I’m currently in the process of applying for Permanent Residency in Australia and holy mackerel is it a long and loaded process! As an American a little part of me is an entitled, spoiled, white girl who thinks I should just be able to fill in a form, tell them I’m not a baddie (Aussie speak for bad guy), and go on my way. But no. I have to trudge through all the bureaucracy and mountains of paperwork like the rest of the population and wait my turn. (Cue foot stomping). Let me share with you a tiny bit of what is required. Fingerprints, sent to the FBI (12-16 week turn around time), Australian National Police Check, Blood Tests, Chest X-rays, family history (including step and half siblings and their marital status), certified copies of everything from my passport to my first library card (ok the library card part is a lie), four new passport style photos, three different forms all five plus pages in length, a personal story as to how I came to be in Australia and married to that handsome guy with the cute accent, and a little more than $4k. Just for starters. Thank goodness for Google and the really nice lady at Immigration who answered my questions! I’m hoping the process for Lucas’ green card is less painful, but I’m not betting on it. During all of this I have to keep reminding myself it’s all worth it. Australia is a pretty great place to live and I was lucky enough a couple of weeks ago to experience even more of what this great country has to offer. My little family packed our bags, left our coats in Canberra and headed for warmer, sunnier weather at the Gold Coast. It was exactly the little break we needed, and bonus! We were able to spend quite a bit of quality time with some old friends of Lucas who I now get to call my new friends. The feminine half of our friendly duo is also an American and I wish she lived closer! It was so refreshing to spend some time with someone who knows what it’s like to challenge yourself with a move to a new country. Dare I say, it made me feel human again! Little victories. 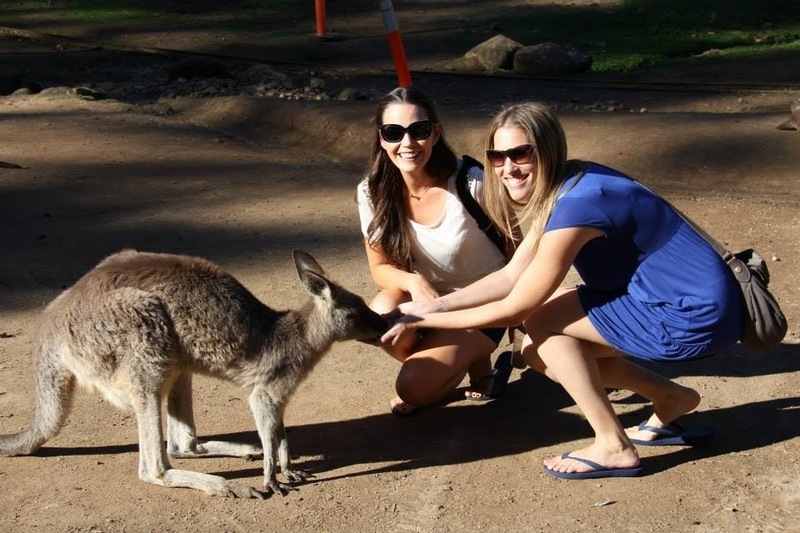 Lauren and me, a couple of American girls in Oz. Since moving to Australia I’ve been hearing about all these fabulous things there are to do and aside from visiting some of the most pristine beaches on the planet, I’d yet to experience anything truly Australian until we visited the Gold Coast. While it is yet another gorgeous beach, a little bird told me that I could cuddle a Koala just twenty minutes up the road. Stop. The. Press. A lifelong dream of mine was going to come true! We toured the Currummbin Wildlife Park and paid $30 to have our photo taken while cuddling the cutest of wild animals known to man. I was so stinking nervous and heart-poundingly excited to hold the little guy I was afraid he would feel my nerves and claw me to death with the sharpest, longest claws I’ve ever seen on a 1 and a half year old. All went well however, and he was as snuggle-riffic as anything called a bear could be. I can’t remember his name but he was so soft! 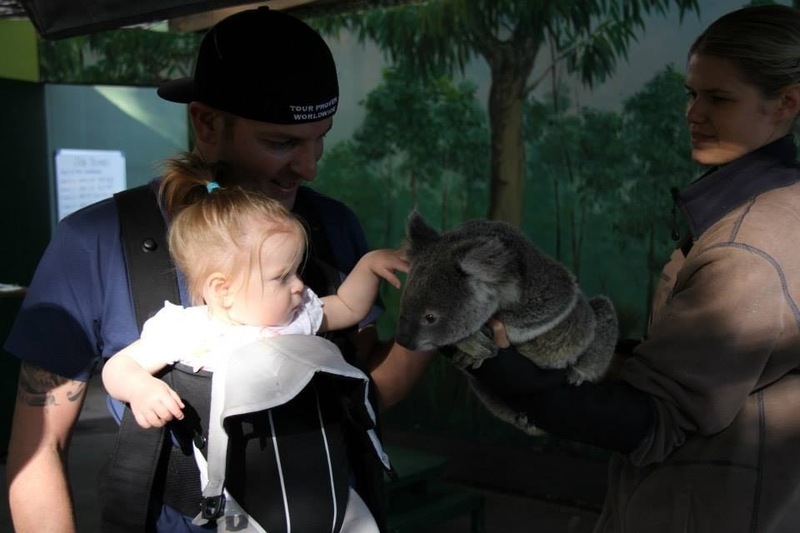 Charlie also wanted to get in on the Koala cuddling and in true Australian hospitality, the handlers let her have a pat as well. After feeding Kangaroos, cuddling Koalas, seeing Dingos, Tasmanian Devils, Wombats, and the largest Crocodile I hope to ever see, I feel a little more experienced here. I can’t wait to take my family and friends on these adventures when they visit us here. Life is happening here and now and I’m busy living it, and loving it! Stay tuned for the One Hot Mess adventures that I am positive will ensue as I proceed down this Immigration track, dual citizenship is so much easier when you’re born with it. Count your blessings Charlie!